This ‘full on’ marine painting includes has surprising story, a twist upon the traditionally yarn outlined via the ‘further reading’ link below. The title in a ‘sound bite’ way says it all however; what was actually happening has been routinely misinterpreted. Gordon Frickers brief was to explore and paint lesser known but interesting aspects of the story of Nelson, Victory and Trafalgar. 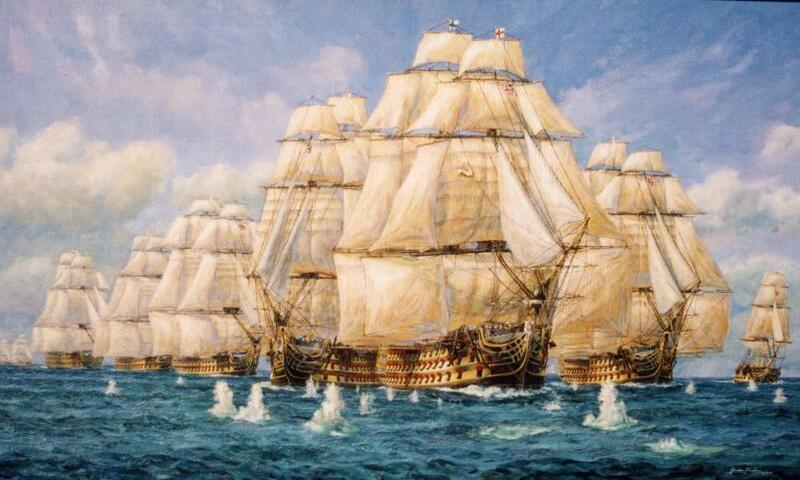 At the moment portrayed hole appeared in HMS Victory‘s fore topsail, the Combined Fleet had found the range. Gordon Frickers extensive, meticulous research included reading widely and visiting archives and speaking with experts in London, Madrid, Cadiz, San Sebastian (Naval Base), Paris, Brest (Naval Base), Liverpool, Portsmouth and of course, his own home port of Plymouth. Gordon Frickers had the privileged and honour of being official marine artist to HMS Victory for Victory 2005 Ltd, a unique and unrepeatable situation. The program was to raise funds to support the efforts of Mr. Peter Goodwin, Keeper and Curator, and his team of experts to return Victory to her original ‘Trafalgar’ condition for the 2005 bi centenary. The Society of Nautical Research was the largely responsible for saving Victory in 1921 for posterity and continues to support the ship’s well being. However the ship they saved had been drastically altered since Nelson’s days. 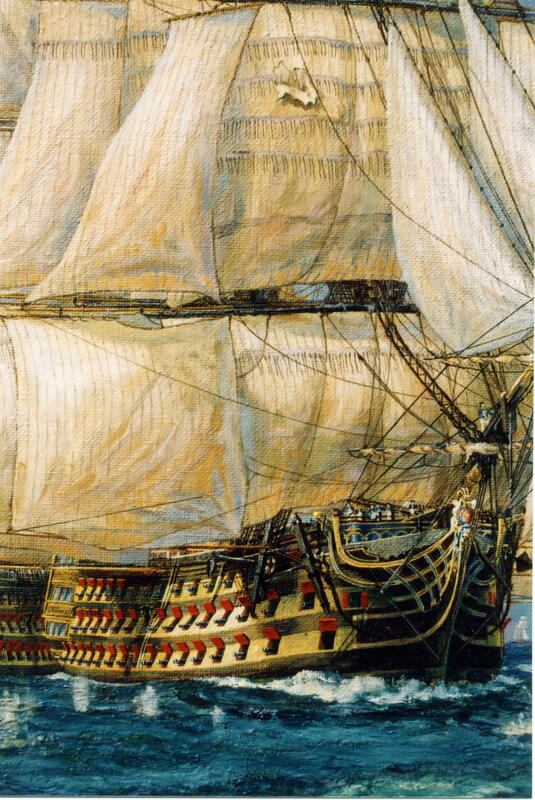 Click on the image above or the image below to see more of the fine quality and detail of this remarkable marine painting. 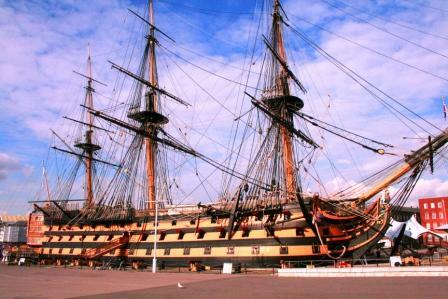 The restoration was an awesome success as you can discover for yourself if you take the ‘long tour’ or have a private tour of HMS Victory. Click on the small images to see detail from First Shots, Trafalgar. Further reading , Trafalgar, what was The Nelson Touch? 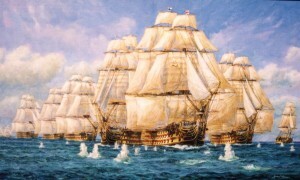 HMS Victory coming under fire at Trafalgar. We hope you are enjoying your visit, found something you like and follow our posts. Kindly spread the word to all the collectors you know who enjoy and appreciate fine art, if you think this project deserves success, you can help us make this project widely know, thank you. You could acquire or commission a painting like this.